There's absolutely nothing wrong with writing down a "bucket list." It's always good to have future adventures in mind. Setting goals that can be attained at various stages of your life is another way to nudge yourself forward. Without goals, your life could become stagnant. There's one common factor surrounding each goal you set. You need to be as healthy as possible to reach your goals. Getting the proper amount of sleep each day plays a significant role in your health. Learning stress management techniques is another way to take care of yourself. Inactivity is not good for you. It's important to find a form of exercise that you enjoy and commit to exercising on a regular basis. Good dietary habits are one of the best ways to stay healthy. Sometimes, you need a little something extra to assure that you're getting the vitamins and nutrients your body needs. Calcium is a vital part of a healthy living regimen. Calcium pills can be difficult to swallow. It's also easy to forget to take them when you're rushing around trying to fulfill your daily obligations. 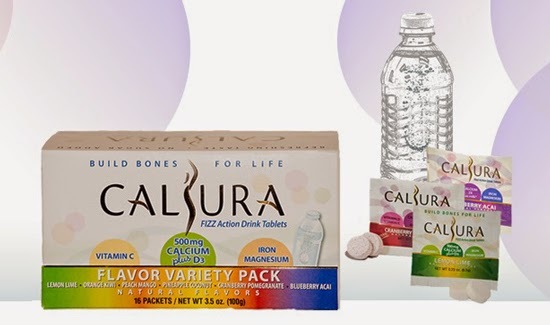 Calsura is a convenient way to add calcium to your body. These calcium tablets come in a variety of flavors. All you have to do is drop one in one of the 8 ounce glasses of water you're drinking as part of your healthy lifestyle routine. In addition to calcium, these tablets also provide iron, magnesium and vitamins C and D.